Harry & David and Soldiers' Angels Deliver Cheer to U.S. Armed Forces With Semi-Annual "Moose Munch(R) Bars for the Troops"
Harry & David and Soldiers' Angels Deliver Cheer to U.S. Armed Forces With Semi-Annual "Moose Munch® Bars for the Troops"
MEDFORD, OR--(Marketwired - Nov 6, 2013) - On November 6, 2013, Harry & David will kick off the semi-annual "Moose Munch® Bars for the Troops" program, which allows families, friends and supporters of soldiers in the U.S. armed forces to purchase the popular Harry & David® Moose Munch® treats and send them domestically to military families as well as to war zones for enjoyment by our men and women in service. The program will launch just in time for Veterans Day, when we honor those who have served our country, and will continue on through December 24, 2013. The iconic American gift curators have once again teamed up with Soldiers' Angels, a non-profit agency that ships care packages to soldiers in combat, to deliver the sweet taste of chocolate to those serving in the Army, Navy, Air Force and Marine Corps. Since the fall of 2010, nearly 363,000 Moose Munch® Bars and Bites have been shipped to soldiers in military bases abroad as well as to local U.S.-based military families, through the "Moose Munch® Bars for the Troops" program and Harry & David donations. "Veterans Day is a day for honoring the distinguished men and women who have served our country, and at Harry & David we are so grateful for their service," said Craig Johnson, CEO of Harry & David. "We have partnered with Soldiers' Angels on the Moose Munch® Bars for the Troops program for the past several years now and are continuously moved by the work of this charitable organization. We are thrilled to be able to help bring some happiness to the lives of those serving our country and their families." Harry & David retail stores nationwide will offer customers the opportunity to purchase Moose Munch® Bars and give them to soldiers with a personalized message. Each bar and note is packaged with a plastic spoon and sent to Soldiers' Angels to be dispersed to military bases in war zones abroad as well as to local U.S.-based military families. At many military bases, the 100-degree heat melts the signature chocolate, caramel popcorn and nuts confection into a lusciously gooey treat that makes it easy for our soldiers to enjoy the sweet taste of home. Most perishable dessert items cannot be shipped into war zones, but we continue to hear that Moose Munch® Bars are one of the most requested items from soldiers serving in combat. 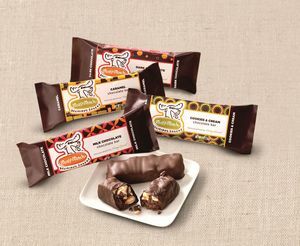 Moose Munch® Bars retail for $2.95 each. For Harry & David store locations nationwide and for more information, visit us at www.HarryandDavid.com. Connect with us at www.facebook.com/HarryandDavid, or follow us on www.twitter.com/HarryandDavid. Nearly 80 years ago, Harry and David Holmes turned their extraordinary pears into the perfect gourmet gift. You can still send our Royal Riviera® Pears as well as many other high quality fresh fruits, handpicked to our exacting standards in our 19 local orchards and in many other orchards around the world. We make it easy to send gourmet gift baskets and edible fruits in addition to our many flavors of Moose Munch® Popcorn, chocolate dipped pears, truffles and much more, most of which are made in our own kitchens from recipes honed over time. We hand pack our gift baskets and exclusively designed gift boxes and top them off with a hand tied bow. Then we ship our specialty food gifts to arrive on time, in perfect condition. Guaranteed. Through our stores, wholesale, catalogs and websites, gourmet food and home gifts from Harry & David and its brands Cushman's and Wolferman's are designed for festive occasions, entertaining and enjoyment throughout the year. Harry & David is a trademark, service mark and DBA of Harry and David, LLC. HarryandDavid.com. Soldiers' Angels is an award-winning 501(c)(3) non-profit organization with hundreds of thousands of volunteers providing aid and comfort to members of the U.S. Armed Forces, veterans and military families through a wide variety of hands-on projects and volunteerism. For more information, visit www.soldiersangels.org or call 615.676.0239.